Real Name: (first name unknown) Krahn. First Appearance: Spawn #27. What's the Story? : It is said that there is a balance between genius and insanity. That same balance is separated between a line that is as fine as a razor's edge. Philip Krahn was cut from the wrong side of that razor. His scars run deep. Krahn comes from 'old money'. His father was a wealthy steel tycoon from Boston, Massachusetts. He and Philip's mother did extensive traveling most of his formative years leaving Philip to be raised and home taught by his grandmother. Philip's grandmother instilled in him at a very early age a hard-line puritan foundation of religion. So hard were her teachings, they bent the young boy's beliefs to a warped curve. Krahn began preparing himself to lead God's army at a very early age. Krahn made sacrifices to try and please God as a child. Acts that were more self-abuse than sacrifice. 'As an offering toward the end of my suffering, I took out my left eye with a sharp stick. Then I marked my face with a cut deep enough to scar me forever,'young Philip Krahn remembered. 'Even with that, my prayers went unanswered, so I knew I would have to give more of myself. Without hesitation, I sacrificed by right arm,'Krahn added. He used his almost unnatural talent to construct metal into very highly technical machinery and weapons. His obsessive ways with religion and invention separated him from the normal track. He was shunned by those around him. Philip looked down on those thinking them a part of the mass of unbelievers. With the appearances of various super powered beings, Philip felt that God was overlooking him for the position of Heaven's general. 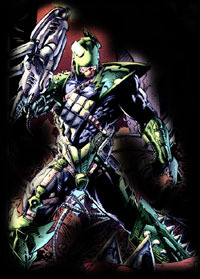 Spawn was the final stone cast that pushed Krahn's twisted mind over the edge of no return. To enter Heaven and insure his place with God, Spawn must die. Again, Philip Krahn was denied. Spawn not only defeated Krahn, now known as The Curse, but he humiliated him and left his torn and battered body on the wall in the alley as a warning to all that cross him.Trouble continued to plague The Curse, this time in the form of the vampire, Sansker. His interrogation of The Curse proved to be most painful. Eventually The Curse was free and began to plot and reconstruct his revenge on Spawn. Truly his place in Heaven had been denied. Now he would make a new Kingdom for himself: Hell! He would learn the secrets to master the necroplasm that Spawn is made of. When those tales are revealed to him, he will have the ultimate power over Satan. The dissection of Spawn will be the tool to give him that power. The demented mind of The Curse prove to be his undoing. Spawn once again brought an end to Krahn's plans. The Curse proved that he would truly sacrifice everything to attain his goal. He set off an incredible explosion that brought his hellish castle to rubble. When the dust had settled, the remains of The Curse were nowhere to be found. Is this his end or just the beginning of a rebirth that will descend on Spawn once more like a windfall of bloody razors?